My husband and I spent the weekend in Carmel last week. A local artist’s work was showing at a gallery–he was a friend of a friend and we were kindly invited to attend. We also used the quick getaway as an opportunity to get me back on my bicycle again. It has been months since I’ve spent time on my bike and my husband was beginning to think I would never use it again. We rode the 17-mile Drive route on a overcast day, stopping once or twice to appreciate the ocean views and snap a picture or two…or twenty. Following these bike rides is always lunch in town and a stop at one of the bakeries on Ocean Ave. This time, we parked our bikes and recharged at Cantinetta Luca. The restaurant offers Italian fare with a casual, trendy vibe in an open, airy space. Next door is a salumeria (by the same owners) that I always make a point to visit for my supply of guanciale. They also offer fresh pastas and fresh bread made on the premises daily. At the cantinetta that afternoon I ordered a salad and also bowl of soup to ward off the chill. Ribollita was the offering of the day, a rustic Tuscan soup traditionally made out of another type of leftover soup (some sources say out of leftover minestrone though ribollita has no pasta in it). The leftover soup would be “reboiled” and made new with the addition of stale bread. 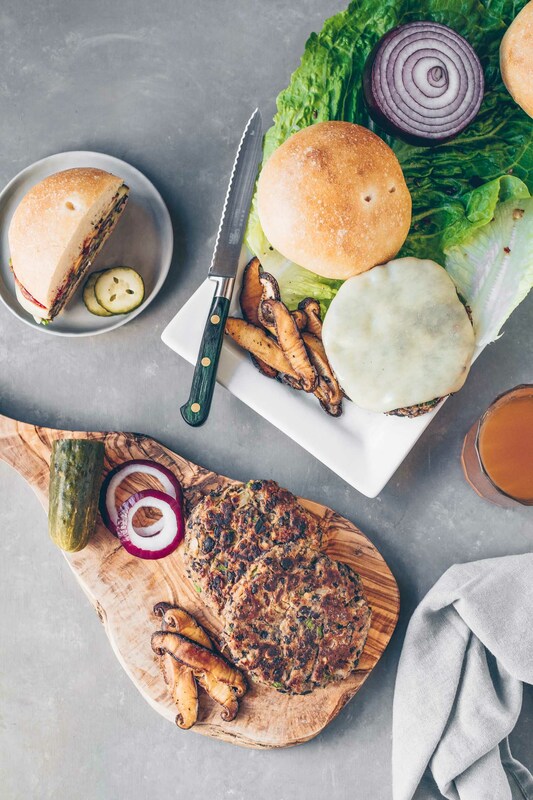 While recipes can vary greatly, traditional ingredients include cannellini beans and inexpensive vegetables–carrots, celery, cabbage and/or kale. I highly doubt that my ribollita at Luca was made out of leftovers but it made quite the impression on me. Simply prepared with cabbage, cannellini beans, bread and pancetta, it was so tempting to order a second bowl despite the large plate of salad still waiting to be eaten. As luck would have it, our friends happened to secure reservations at the same place for dinner after the gallery show. So that night I was once again reunited with the ribollita and had the chance to sample the restaurant’s squid ink pasta that I was sorry to miss at lunch. This is my version of ribollita. None of the recipes I consulted was exactly alike–some called for carrots, others not; still others called for tomato paste while others, diced tomatoes. Kale or no kale? Grill the bread first or not?–but there was a similar thread in preparation. The process involved nothing more than sautéing vegetables and adding broth but I found the two keys to making this soup special despite its very short time on the stove: puréed beans and garlic-rubbed grilled bread. Puréeing half of the cannellini beans before adding them to the soup adds the thick, creamy quality (and deep, long-simmered flavor) that is characteristic of this rustic soup with peasant origins. Rubbing the slices of bread with garlic before adding them to the soup also adds another layer of flavor that I wouldn’t consider skipping at all. We enjoyed this soup so much that we had it for lunch and dinner several times last week. I reboiled the soup as the contents of the pot ran low, adding more stock, beans, cabbage and kale. Since my husband stays away from pork and beef, I cooked the pancetta separately and just sprinkled a bit on top of mine making this an easy vegetarian option. I did take one or two liberties: I added chili flakes for some punch and fresh oregano, both additions I would also recommend. 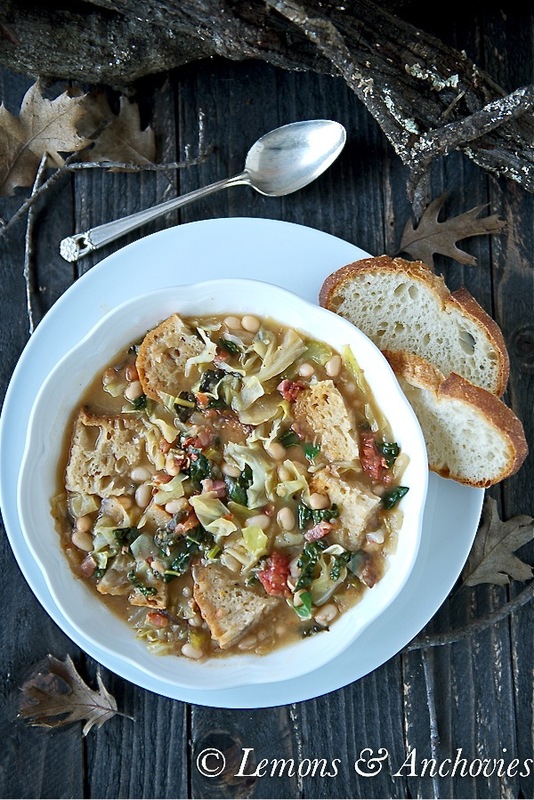 This ribollita has quickly taken over the top spot of my list of go-to soups. Easy, hearty, healthy and satisfying, it’s a winner no matter how you look at it. Easy, healthy, hearty and satisfying, this "reboiled" soup is a winner. In a large pot, cook the pancetta over medium-high heat then remove from pan and set aside. Using the same pot with the fat rendered from the pancetta, add 1-2 tablespoons of olive oil. Add the onion, celery and oregano and cook for 4-5 minutes. If the onions caramelize too fast, turn the heat down to medium. Season with a pinch or two of salt and add the chili flakes and no-salt seasoning at this time (if using). Add the cabbage and kale and cook for another 2-3 minutes then add the diced tomatoes. Pour in the stock and bring to a boil. Once the stock is boiling, reduce the heat to medium low, stir in the bean puree and cook for about 5 minutes. Add the whole beans and cook for another 2-3 minutes. Cut up the toasted bread that was rubbed with garlic in bite-size pieces and place a few pieces in the serving bowl(s) and ladle the soup on top of them. Serve. This sounds wonderful Jean, It’s so funny because I’m just like you, always inspired by great restaurants. I come home and fiddle around till I figure out whatever it was that we enjoyed so much. 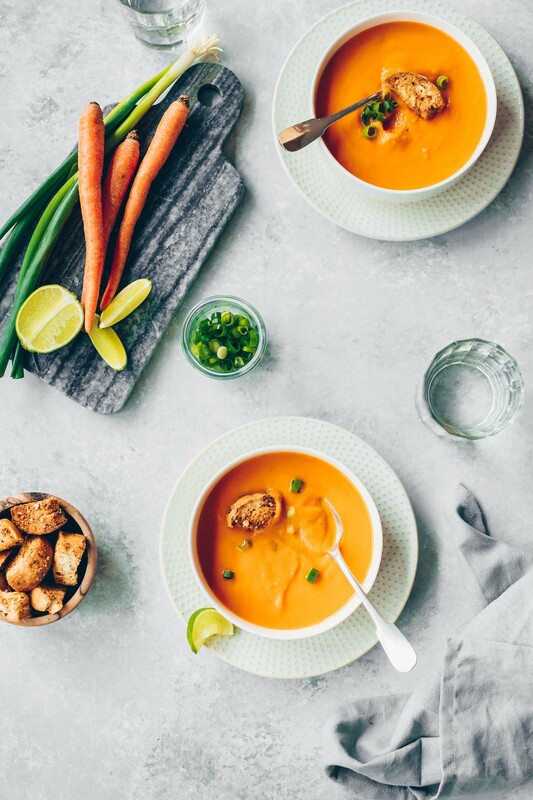 Jean – when I saw your Instagram of this soup, my mouth was watering. I am so happy you put it on the blog. 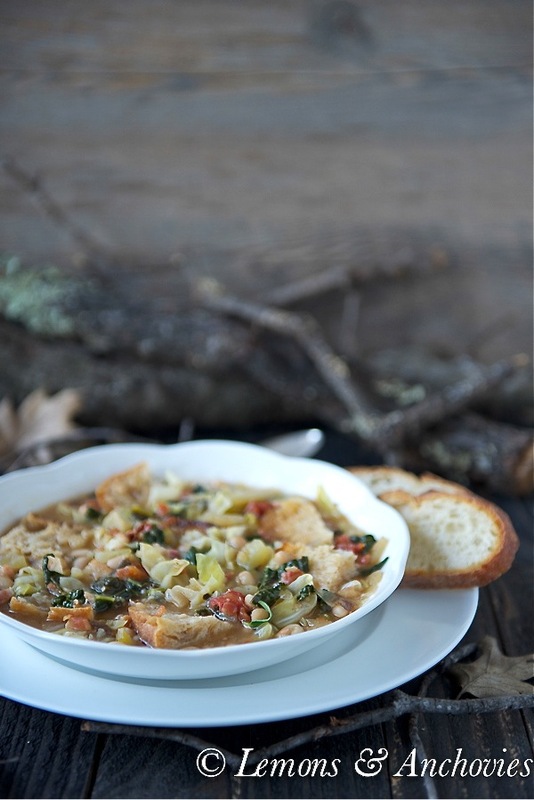 I have always wanted to make Ribollita and NOW I have a great recipe. LOVE your photos!!!! A fabulous winter soup! tasty and warming. Definitely a winner! I just love rustic soups like this, creamy and thick with puree. It looks absolutely delicious! Last time we were in Carmel we ate Cantinetta Luca-such a fun place, were you serenaded by the waiters? How cool to cover 17 mile drive on bicycles-you worked up a good appetite for dinner! Me, too, Patty! Cold days aren’t as bad when this is waiting for me on the stove. I haven’t been serenaded by the waiters at Luca yet…hmm, I’ve been missing out! Yes to the pureed beans! They are a great way to add thickness. It’s a good tip for folks who may want to avoid adding extra fat like cream to a soup. Plus, the flavor is in line with the other ingredients. Guess what, we’re going to Monterey/Carmel this weekend. We decided to go after I saw you were there (thanks for inspiration!). Hope we can squeeze in to go to our favorite Cantinetta Luca! I want to try this recipe. It looks so comforting. I usually cannot make soup that has lots of beans because of my husband + kids not being a fan of beans. For once I want to eat what I want to eat… this looks so good. I enjoy a rustic soup like ribollita. It reminds me of being in Italy…in a farmhouse somewhere in Tuscany! LOL! There’s no harm in dreaming, right? 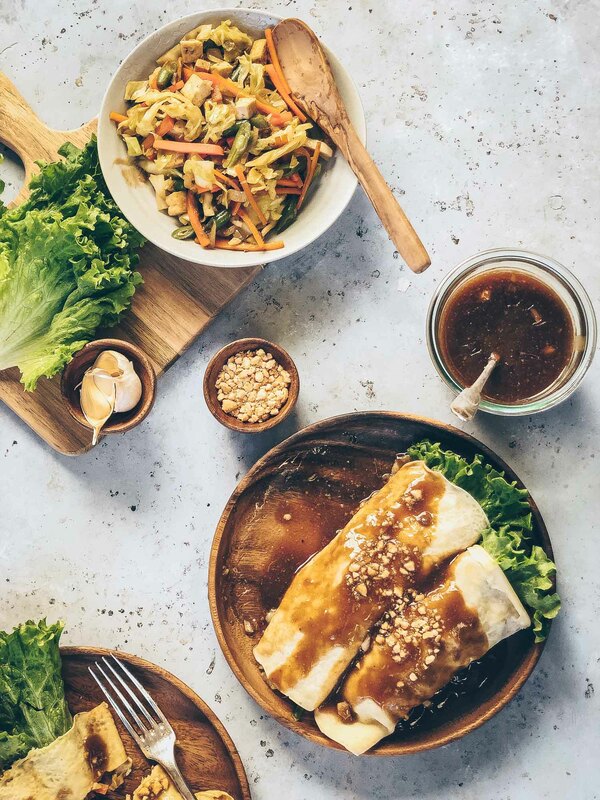 BUt food really connects us to places and memories…that’s perhaps why I love food so much. Hehehe…Nice soup! This soup looks incredible! Such wonderful flavors, and I think with a thick slice of bread I’d be happy as a clam!